We may not be getting a full-fledged Wonder Woman game any time soon, but a cross-promotion event for Injustice 2 looks like the next best thing. 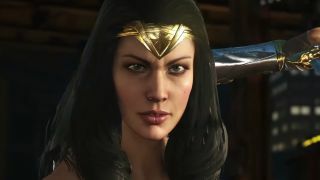 From now until June 5, you can take part in a special event that will let you deck Injustice 2's version of Wonder Woman out in the new film's equipment. Here's how you'll acquire the legendary Amazonian armor: fire up Injustice 2 and head to the Multiverse option from the main menu (it's under "Single Player" if you weren't already aware). Once there, find the "To End All Wars" event. In this challenge, you'll take on five ladders of opponents as Wonder Woman, and each successful completion earns you a piece of the DCEU costume Gal Gadot wears. Be warned: the final challenge is the most difficult and is recommended for those who have reached level 20. But should you persevere, your reward is a powerful shield and sword, plus completion of the set. Once you're done clearing that particular hurdle, you can look forward to Injustice 2's DLC fighters, coming soon. And in other alternate reality news, here's what Joss Whedon's version of Wonder Woman would've been like.